Pre-inked or self-inking stamps offer you a quick and tidy means of leaving your mark on all types of products, forms and records. If you have always used the clumsy, old stamp and ink pad setup, these pre-inked stamps offer an efficient treat for labeling paperwork, endorsing cheques for deposits, placing your return address on envelopes and for getting your name on documents. We supply a wide range of pre-inked stamp options to suit your stamping requirements. We assure you our stamps are easy to design and order. You can choose from various ink colours, and decide the colour of your choice. Our pocket size pre-inked stamp can be provided in various colours too. We offer volume discounts on custom pre-inked stamps. 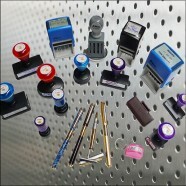 We also offer portable pre-inked pen stamps which come in different pen colours and choice of ink. We also offer discounts for bulk orders of this stamp. All impressions made with these stamps are sharp, clean and precise; starting from the first impression to the twenty-thousandth impression. We process your instant pre-inked stamp in 30 minutes of receiving your order, with a lifetime guarantee. To ensure you can continuously use our instant pre-inked stamps, we also offer pre-inked refills. You can choose between blue, red, green, black and violet colours for your refills.